He first flew the P1127 in the early 1960’s, and like fellow Test Pilots also flew the very different Short SC1 VTOL aircraft, which had four lift engines and one for forward propulsion; he described managing all five engines as one transitioned between forward flight and the hover as being ‘ like a frantic organ player ‘. 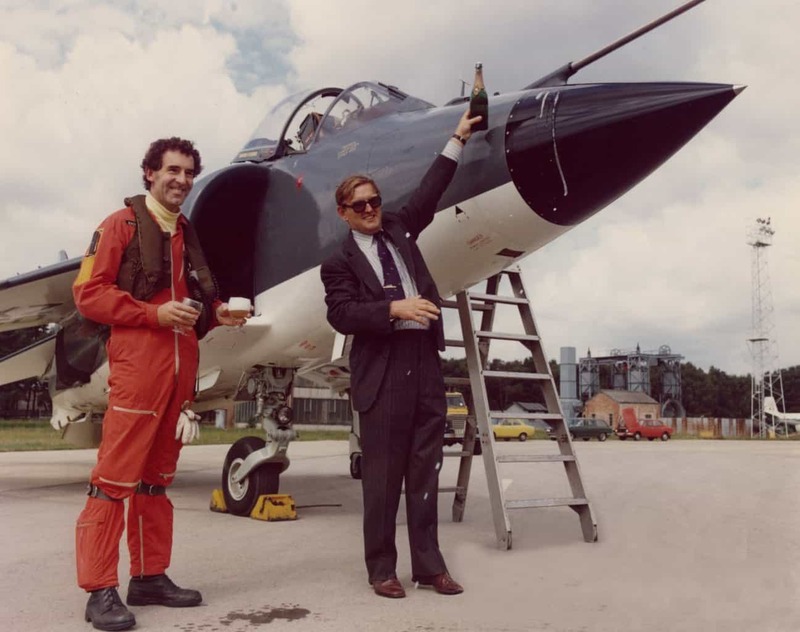 John became Dunsfold’s Chief Test Pilot in 1978, demonstrating the then new Sea Harrier at that year’s SBAC Farnborough Show and going on to become world renowned for his display and test flying. His development flying in the early Harrier was crucial to its success; there is a potentially lethal regime in the hover known as ‘ Intake Momentum Drag Yaw ‘ where if the pilot is not very careful the mass of air into the intakes will take over in a crosswind, creating uncontrollable roll; this had already killed a few pilots, there is a Dunsfold Flight Test cine film of this happening to an unfortunate American pilot – sadly he ejected too late, into the ground; the whole situation is viciously dangerous. 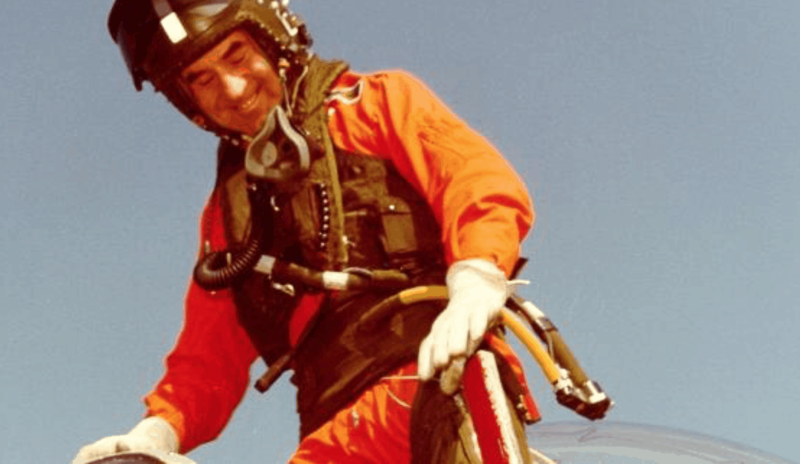 He would hover the aircraft at around 100′, then using the Reaction Controls, raise the nose to around 60 degrees, adjusting the main engine nozzles to suit, so the aircraft was still hovering, but with a high nose up attitude; he would then apply maximum power and ‘ rocket climb ‘ away. There are no gauges or instruments to aid this, it was all by ‘ seat of the pants ‘ judgement. Service pilots were forbidden from even thinking about trying it ! John had to retire from BAe Test Flying in 1983 when he reached 50, a company rule; he then became Dunsfold Airfield Manager, and astonishingly was equally as good at that as he’d been at flying; his motto is ‘ UK Ltd ‘ and he would help out any smaller British Aviation outfit if at all possible. When Deputy Chief Test Pilot Taylor Scott was killed by a combination of failings of an ejection seat system in an early Harrier GR5 flying from Dunsfold, John stood up to the CEO and said the company should pay the insurance to Taylor’s widow Maggie. Having principles cost John his job – as he knew it might, but he is not the sort of person to let such things go unsaid. Many people at Dunsfold concluded ‘ if any aviation company thinks they can do without a talent like John Farley, the lunatics really have taken over the asylum ! ‘ Eventually John was proved right, Taylor’s widow beat the BAe lawyers and used the money to put their children through school. John returned to Test Flying on a freelance basis, flying among other things the very advanced Israeli Lavi fighter project demonstrator, and has advised on the F-35 Joint Strike Fighter. His book ‘ A View From The Hover ‘ is regarded a classic, for reference as much as entertainment, among serious pilots. John’s lecture on the history of the Harrier is well worth a read. The Daily Telegraph’s obituary is here. Video of John Farley’s Brooklands Lecture on the Harrier Story. Excerpt from doco on the Harrier, featuring the Flying Bedstead. 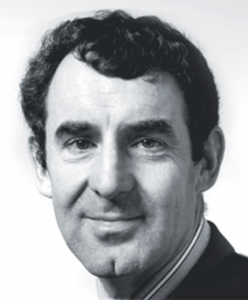 Hawker Siddeley’s chief test pilot who was the first to land a Harrier jump-jet on a ship and had a ‘climb’ named after him. As the first test pilot to land a Harrier jump-jet on a ship, John Farley earned himself an honourable mention in the history books about the Falklands conflict. “Without the Sea Harrier,” declared Admiral of the Fleet Sir Henry Leach, then first sea lord, “there could have been no Task Force.” The Royal Navy paid tribute to Farley’s work: “as courageous as it was revolutionary”, for which the Fleet Air Arm would be for ever thankful. The little 25ft by 46ft Harrier’s versatility was essential because Britain in 1982 no longer had a full-sized aircraft carrier. The flagship, HMS Hermes, was a “light carrier”, and HMS Invincible a “through-deck cruiser”. Farley’s outstanding flying skill from his joining Hawker Siddeley in 1967 convinced the company’s “team of believers” of the Harrier’s potential. He could hover at 100ft, then tilt steeply and shoot skywards — a manoeuvre known as the “Farley climb”. He first landed his Harrier on the US navy’s amphibious transport dock USS La Salle, at Norfolk, Virginia, in May 1969, and in 1973 prompted research into its anti-ship potential by firing from it a 1,800lb Anglo-French anti-radiation Martel missile off Dorset at Lyme Bay. To develop carrier landing techniques he used the Indian navy’s Vikrant and the French navy’s Foch — the Foch’s captain obliging him by slewing about in a stormy Bay of Biscay to make things as difficult as possible. The GR1 Harrier, in RAF service from April 1969, was for Cold War tasks on land. Sea Harriers entered Royal Navy service in 1980. The 28 Falklands Sea Harriers had American AIM-9L Sidewinder short-range air-to-air missiles. Battle Group commander Admiral Sandy Woodward noted on May 21: “our entire performance is rather hanging upon that of the Harriers”, which had scored nine of the Task Force’s 14 “kills”. The Harriers’ tally rose to at least 23. Farley flew about 100 different aircraft, from Spitfire and Hurricane to Vulcan. In 1990 a Russian pilot, whom he had defended from a ticking-off at an air show, invited him to fly his MiG 29. Farley became the first westerner to pilot a MiG, and performed its celebrated “tailslide”. 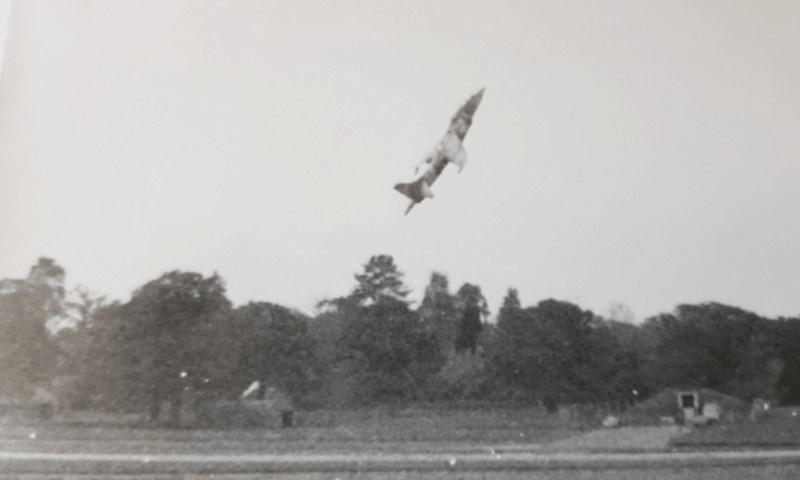 Farley played down injuries including a painful back from testing an ejector seat, but spared no pains to help colleagues, and could hold a class of engineering students spellbound. His memoir, A View from the Hover, is a sought-after pilots’ reference book. John Frederick Farley, an only child, born in 1933, wanted to be a pilot from the moment his aunt Mabel gave him a book on aircraft recognition for his tenth birthday. His first flight was for five shillings in a Miles Messenger in 1949. His parents, Charles Frederick, known as Fred, and Winifred, ran a drapers’ shop, where he polished the brass before school. He took to making model aircraft, and one he powered with a diesel engine worked so efficiently that its propeller broke a little finger, leaving it bent and shortened. That teenage accident, and the removal in childhood of “hammer toes”, one on each foot, turned him into an engineer — because the RAF recruitment form he picked up, on leaving Hastings Grammar School aged 17, required that entrants have “no deformity to the hands or feet”. So he took competitive exams and completed a five-year student apprenticeship at the Royal Aircraft Establishment Farnborough, before getting into the RAF after all in 1955 — even though the finger attracted comment, sticking out when he saluted — to train as a pilot on piston Provosts and de Havilland Vampires. Posted to RAF Valley on Anglesey, he met his wife, Patricia Fox-Russell, at a dance. She was the niece of Captain John Fox-Russell, VC, one of whose brothers, Henry, an aviator, had been killed while flying in 1918. Later the family would speak of “Uncle Henry incidents” when Farley escaped death by a whisker — or possibly by Uncle Henry’s warning dinning in his head. A civilian career with Hawker Siddeley followed, with sales demonstrations around the world, Patricia often accompanying him. Good looking with dark, curly hair, he would swap his orange flying suit for Sixties fashionable white shoes and flowered shirts. At home his record collection included Janis Joplin and Elkie Brooks. He and Patricia had two daughters, Sheila, who farms in Germany, and Kim, who teaches astrology. A strict father, with a dry sense of humour, he was a perfectionist who never rested, often doing plumbing, electrical work or carpentry at home. He and Patricia were divorced, and he married, in 1981, Adele Pattison. He acquired stepchildren Claire, now in a senior post at University College London, and Alan, in IT. In old age he still made model aircraft from balsa wood. I learned yesterday that Harrier test pilot John Farley had passed away. He personally signed a copy of his book’A View from the Hover’ for me in 2010. A thoroughly nice man and will be sadly missed in the aviation field. My condolences to his family and friends. I’ve just heard that John Farley, the chief test pilot for the Hawker Harrier (designed and built across the river in Ham), has passed away. I’m writing this to the science group because he was a tremendous explainer of engineering concepts. This article is a short biography, including a wonderful explanation of how the Harrier achieved control in hovering and transition to normal flight. It’s accessible to complete non-scientists. I attended a lecture of his at Brooklands a few years ago, and naturally ended up buying his book, A View from the Hover. The only way to get it was to email him with an order; he then replied with his bank details! Having received and read the book, I emailed him with a question on a particular issue. He replied, saying that it was far too complicated to explain in an email. ‘When do you get home from work?’ That evening, I got home and he phoned me, and talked me through the aerodynamics of the Harrier for 45 minutes, until I was not only entirely happy my question was answered, but was solidly grounded in all the basics of VSTOL flight as well. I’ve discovered this evening that the video of him talking about the Harrier on this page has been removed from Youtube- I hope it reappears, because it was super. Hi Ed, I have just found a different video version of his lecture. It is now on the site. As a retired US Marine Harrier pilot that started flying the AV-8A in 1971 I had the pleasure of meeting Mr. Farley on one of my trips to England in 1972/73. He was a great man and an outstanding aviator. He will be missed. Yes- I found that too- the whole lecture at Brooklands. It’s great. But the one that was missing was the other video- the one where he’s actually moving the nozzles and controls with a real (museum) Harrier. That was removed from Youtube during last Friday by whoever uploaded it- I was watching part of it in the morning and it had gone by the afternoon. I don’t know whose it was, but the only link to it was from the embedding from this site. I’d love to be able to see the rest of it! Hi Ed, There were a number of very interesting YouTube videos on the Harrier but I have noticed they don’t stay published for very long. The one you to refer to does not exist anywhere else now – so difficult to determine the original source. But John was doing it with his test pilot experience, and it would be a shame to lose that insight. John’s vectoring sequence is around 4 minutes in. This was just banter, John was too polite to shoot anyone down unless they seriously required it – a true gentleman. What sad news this has been. The man was a genius of the level that many aspire to but only the very best ever achieve. As a lowly worker at Dunsfold for 10 years I marvelled at his flying skills and then as he ‘progressed’ to Aerodrome Manager I admired his passion for the site and how he fought to upgrade the facilities, something that was long overdue. There is a belief amongst ex Dunsfold workers that his passion for the site and how he fought for investment on the facilities led to his demise from the company. Allegedly a senior company figure flying out of the airfield one morning spotted all the new buildings going up around the site and realised that he could not remember giving the financial authority for this work. Mr Farley had been busy arranging the much needed improvements. The trouble is that the seniors at such a company would not even begin to realise or appreciate the level of genius they had rid themselves of. RIP Mr Farley, you inspired and amazed many aviation people around the world. Your influence and legacy will live on with the F35. Thank you Mark. Many of the comments build a picture of what a man John was beyond that stated in the official obituaries. I have found a delightful anecdote from John Farley about how to prevent a Harrier landing on a French Aircraft Carrier. I have edited it and uploaded it onto this page. The video with John moving the nozzles and explaining vectored thrust and the stabilising reaction control ducts at the nose, tail and wingtips is with his beloved G-VTOL, Dunsfolds’ own 2-seat company demonstrator Harrier, now at Brooklands museum.